I got a call on Friday afternoon from Ted and Carol, mentioning they had an extra ticket to the stock show rodeo that evening, and would Leif and I like to go. Leif really didn't want to, and offered to babysit so I could go. Even though we had been to the stock show already, we hadn't been to the rodeo (the times didn't work well with Peter's schedule), so I figured I'd go, bring my camera, and see if I could get any photos. Now I've been to a few rodeos in the past - a few as a kid, and I've been to the Granby Rodeo a bunch, but nothing really prepared me for a real, professional rodeo. Everybody was really good at what they were doing, and it was very exciting to watch. The seats we had turned out to be the best you could get for a photographer. Nobody in front of us, high enough up to see, almost in the center. The lighting in the arena was pretty bad. I had to play with settings a lot to get a decent shutter speed to freeze the action, so I ended up having to shoot at either 2500 or 3200 ISO, just to get a 250 or 500 shutter speed (depending on what was going on). All in all I took just over 600 photos, and while I haven't had a chance to go through all of them, this is by far one of my favorites. Getting a shot like this is really difficult, and when I saw it on the LCD on the back of the camera, I was hoping it was in focus. (it was), and I was hoping that I could reduce some of the noise (I did, using Lightroom). 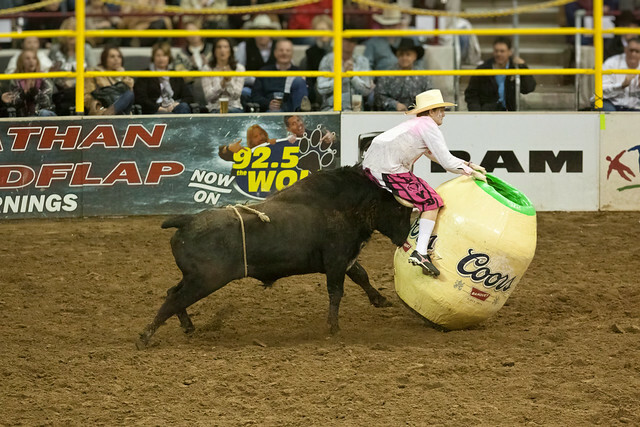 The poor rodeo clown didn't quite make it to the barrel. He was ok, but I can't believe I managed to get a shot like this.